Kira, an orphan with a twisted leg, lives in a world where the weak are cast aside. She fears for her future, until she is spared by the all-powerful Council of Guardians. Kira is a gifted weaver and is given a task that no other community member can do. While her talent keeps her alive and brings certain privileges, Kira soon realizes she is surrounded by many mysteries and secrets. No one must know of her plans to uncover the truth about her world and see what places exist beyond. My 10 year old and I went right to this one after listening to The Giver. We loved it even more than that one! My daughter read ahead during reading time at school (she checked out the book from the school library) but she would still go back with me to listen to the story so I could keep up. The narrator does a wonderful job of portraying the different voices in the story, which is told from the point of view of children. Kira is the main character. She is an adolescent girl who is growing up in a harsh and fairly primitive community. This story seems to be set in a dystopian future, after some undescribed calamity has reduced society to a level of subsistence and survival. She is orphaned, alone, and has a twisted leg. She struggles with how to survive in the community that is dominated by the physically strong. Kira is an artist and has a special gift for weaving. The community leaders recognize this ability and take her in for a unique role. However, Kira's freedom of artistic expression is also taken away. She gradually recognizes that life could be different. The author uses humor and foreshadowing to make the story fun and suspenseful. We enjoyed pausing it to talk about what had happened, what we thought of the different characters, and what we thought would happen next. The story ends in a way that leaves much room for thought and interpretation. We immediately went on to download the third book in this series: The Messenger. I can't wait to start listening to it tonight! As the parent of a child with dyslexia, I am so happy to have discovered Audible.com. My daughter and I can listen to many interesting and challenging books that are at her intellectual level, which would be very time consuming for her to read in print. We choose books she can check out of her school library and she reads ahead with the printed versions at school. She takes Accelerated Reader tests on the books and earns points just like her classmates, and she is developing a joy of reading that I don't think would be there if she had to struggle through the entire printed book. This is the second book in a series of three. Each can stand on their own. If you intend on reading all three you should read the first two first, but it wouldn't matter which one first. The Giver (book 1), Gathering Blue (book 2), Messenger (book 3). Definitely read Messenger last. All the books are short and very interesting. She creates alternative societies in a different future. I thought this (gathering Blue) was the best of the three. I want to clarify something. Someone said Gossamer was for adults and this book was more for children. They switched the two. Gossamer is more about dreams and fairies and is definitely for kids, this one was the 2nd part in the trilogy of the giver, and is great for kids and adults. I liked this book. I thought Matt the little kid was hilarious, and the voice actor did a great job. This book is everything but blue! If you like this part of the review, you should check the whole review at my blog! Inkish Kingdoms in Wordpress or you google me! I remember that the first time I read this book I had a horrible time reading it. I came with all the eagerness to know what happen to Jonas, and this book was nothing related to &quot;The Giver&quot;, or does it? Lowry presents to us a total different kind of society from the first book: a dystopia. However, how far away is the society created by Lowry compared to our society? Isn't our society none inclusive? Isn't our society leaving disable people outside and marginalize? Don't we live in a world that preaches the survival of the fittest? We see a violent and rough world not only for the disabled, but also for the rest of the population. Not nearly as good as The Giver, but as the author states at the start, in a world after total destruction new life can take on may shapes. The magical realism quality of this series really takes foot with this book. Overall, interesting and an ending with both possibility and dread. This book did not match up to The Giver. Half of the book was spent discussing thread. The people lived and acted like Neanderthals yet were concerned about pieces of art and singing, depicting the past and future. Although, "The Giver" stands alone... "Gathering Blue" needs "Messenger" to feel complete and tie the books together. The last two are set in differently evolved communities and much like "The Giver" show how individuals and community values and norms influence the whole. Note that "Messenger" is short and will leave you with a lot of questions. Perhaps there is a forth book coming to complete the series? I was content reading "The Giver" but plan on wanting more after "Gathering Blue" and "Messenger." For juvenile fiction it is very good (especially for a juvenile), but this particular Lois Lowry book is a little more youngish than her other titles, The Giver & Gossamer, which were both in the young adult genre, but meant for adults, too. Feed was another young adult book that I enjoyed a lot. Perhaps there are two levels: juvenile and young adult. If that's it, then I'd better check that out more thoroughly ahead of time. However, I finished the book because I really did enjoy it anyway -- it wasn't as juvenile as Hana's Suitcase, which I could not finish. Listen to all three books from Lois Lowry. Each of them will make you think twice about your own world. Is our society a setup that forces us to live the way we are now? Very thought provoking way of seeing things. the first book "The Giver" will set the pace for the following two books. Great listening that you won't want to stop. Kira has just completed the four-day wake in the Field of Leaving to help her mother's spirit leave the world. Because her mother died of sickness, their 'cott' was burnt down. Thus, because Kira's father died hunting before she was born, Kira is now a homeless orphan. And because she was born with a twisted leg and she's only an adolescent, she'll be hard-pressed to survive in her primitive-medieval post-apocalypse village. Indeed, a group of women led by the scarred and scary Vandara wants Kira's land, and when the girl protests, she's nearly stoned. (The women believe Kira should have been exposed at birth as a cripple.) Kira saves herself by invoking the right to have the dispute settled by the Council of Guardians. Having plans for her uncanny skill at combining colored threads into designs, the Guardians decide to move Kira into their Council Edifice. . .
Lois Lowry's young adult novel Gathering Blue (2000) is the second book in her Giver Quartet, the first being her Newbery-winning The Giver (1993). The Giver is a high-tech dystopia in which the people living in the community have traded away differences, history, and deep emotions for homogeneity, peace, and safety. Because The Giver is so affecting, when I started Gathering Blue I was surprised by its seeming lack of connection to its predecessor. They share no characters, and their settings differ, for Kira's post-apocalypse society is centered on remembering rather than forgetting the terrible past and is low tech--there's no plumbing outside the Council Edifice and the mostly illiterate people live a hand to mouth existence based on female agriculture and male spear hunting. Nevertheless, both books make a set because they feature young protagonists whose special gifts destine them for special roles in their societies and because their societies are dystopias that repress or control their people through systematic ignorance or false beliefs. Kira's life takes an unexpected turn when she starts living in the Council Edifice. She finds a friend in a boy about her age called Thomas who is a gifted wood carver. She learns to make dyes from plants and flowers--all colors but blue, for her village lacks the necessary woad. She gets her first job, repairing the Singer's robe, which is embroidered with scenes from the violent history of humanity culminating in the fiery Ruin that destroyed civilization and left scattered settlements. The novel explores the roles of the artist in entertaining people, maintaining traditions, and creating the future, sometimes as those roles conflict with the need for the artist to express his/her own personal creativity. Lowry's writing is limpid and concise. She depicts believable and sympathetic young characters. Kira is brave, bright, and sensitive, and inspiring when she remembers her mother's loving advice: 'Take pride in your pain. You are stronger than those who have none.' Kira's best friend Matt is an 8-9 year old dirty, lousy, cocky, funny poor boy with an abusive mother and a spicy dialect (gifty, pocky, horrid far, etc.). Lowry fleshes out her post-apocalypse world via language ('cotts' are huts, 'tykes' kids, 'hubbys' husbands, and 'artist' is a nearly forgotten word), names (infants have one-syllable names, post-pubescents like Kira two-syllable ones, adults three, and old people four), and irony (the villagers don't know that the Council Edifice is a former church or that Bogota and Baltimore are names of pre-Ruin cities). I think, however, that Lowry writes more believable main characters than completely convincing future societies. In The Giver, although the transmission by touch of memories from the Giver to the Receiver is vivid and affecting, she doesn't explain the technology behind removing historical memories from the people and placing them all in the Giver/Receiver pair. 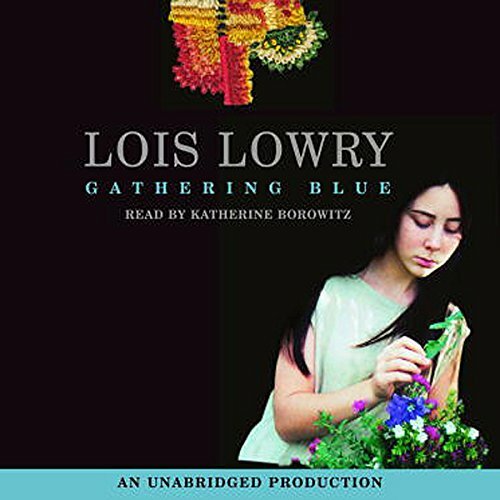 In Gathering Blue, life in Kira's post-apocalypse village feels real, but Lowry never explains the hot running water in the Council Edifice or the policy to prevent villagers from learning the truth about the terrible beasts in the woods or the nature of Kira's ability to receive messages from her thread designs. Lowry avoids some typical YA story developments. No romantic triangles! And no violent action scenes, unlike, say, The Hunger Games (Kira is no Katniss), or even The Giver movie (which features an absurd chase scene near the climax). And she likes ambiguous, thought-provoking endings. The perfect ending of The Giver leaves open whether Jonas and the baby Gabriel he escapes with from his community die of cold and hunger or find a better place to live. But--for this reader--in Gathering Blue she leaves too much unresolved, unlikely, and unlikeable. Kira finally makes a choice I can respect, but given the circumstances not one I can believe that she'd be saintly enough to make or one that would turn out well, despite some hopeful shoots of woad. The reader of the audiobook, Catherine Borowitz, enhances the story in all the right ways with her compassionate and clear voice. People who like The Giver should like Gathering Blue, but although it has more humor and is more poignant than its more famous predecessor, it's also less perfect.